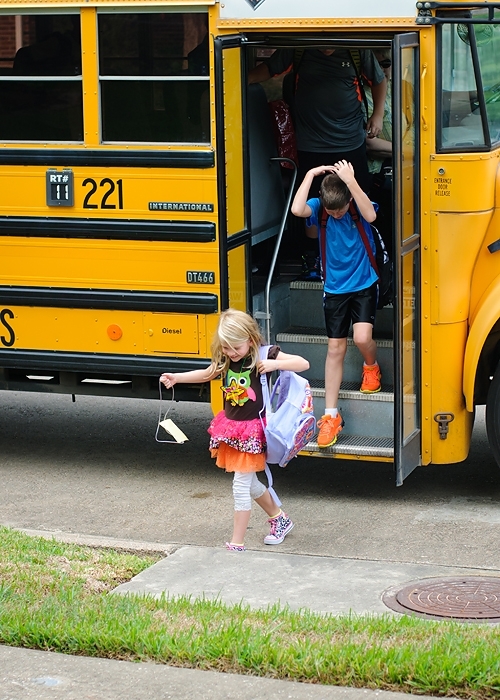 I really do love traditions, and taking pictures of the kids getting off the bus every year on the first and last day of school is one of my faves. 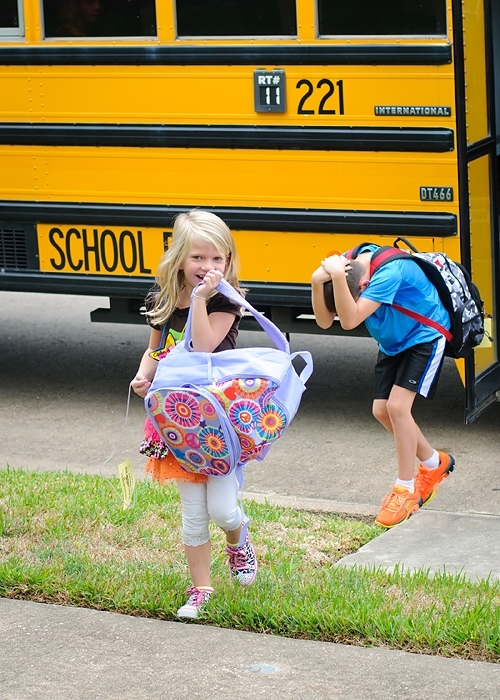 New school, new bus, new bus stop friends…it’s all new this year. Our new bus driver has some big shoes to fill because I pretty much think that our old bus driver, Mr. James, was the best bus driver in the world. I’m sure our new one is a nice lady, but she’s going to be hard pressed to fill Mr. James’ shoes! You’ll notice Logan’s hands going up. He spotted me. He’s such a little booger about the camera lately! 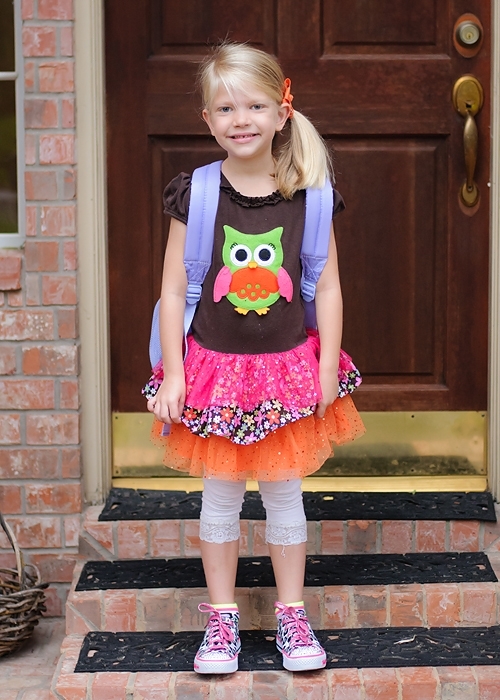 But sweet Camryn…she had a great first day. So happy that she loved school. Yup, Logan wins the dirtbag award for bus pictures. Oh well. Like I always say to my kids, it is what it is. Connor looks like he’s about to plow over that poor girl there. His attitude was definitely better this afternoon than it had been in the morning. Yes, he’s running away from me. Because he saw the camera. Plus he had to get home and play outside. That’s one of the things I love about the school year. They all got home and wanted to play, play, play. The other thing I love (well, besides to ability to complete a thought during the day, take care of piddly errands that I’ve put off for months, and actually keep the kitchen picked up for longer than 5 minutes) are the early bedtimes. Camryn pouted off to bed during story time, and when I went in to tuck her in, she was out cold. It was 7:25. Oh, the bliss of school bed times! 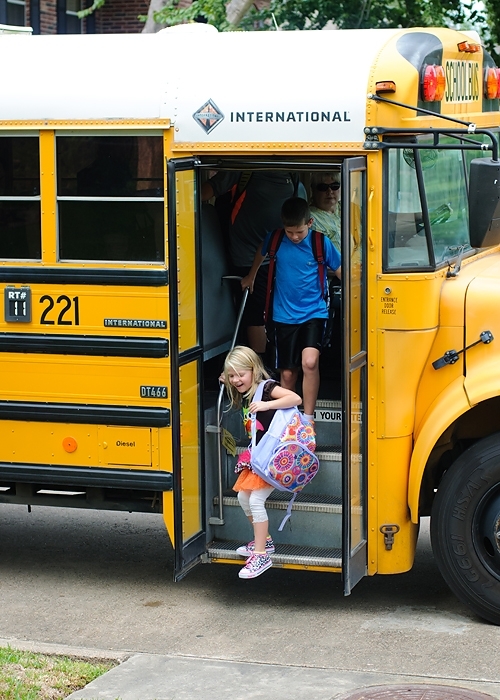 They all had a great first day. All three came home talking about a few kids they met. I know they will make friends in no time, but the boys were worried about that. It’s hard to go from a school where you know everyone to knowing no one! Don’t mistake my title for mixed emotions on my part. The happy day is how I feel about it, and sad is a little more how the boys feel about it. That’s how it always goes for us. I love, love, love my kids. But oh my word, by the end of summer, I am beyond ready for some routine and some space. We all need a break from each other! We had a great summer (and maybe one of these days I’ll blog about some of it.) 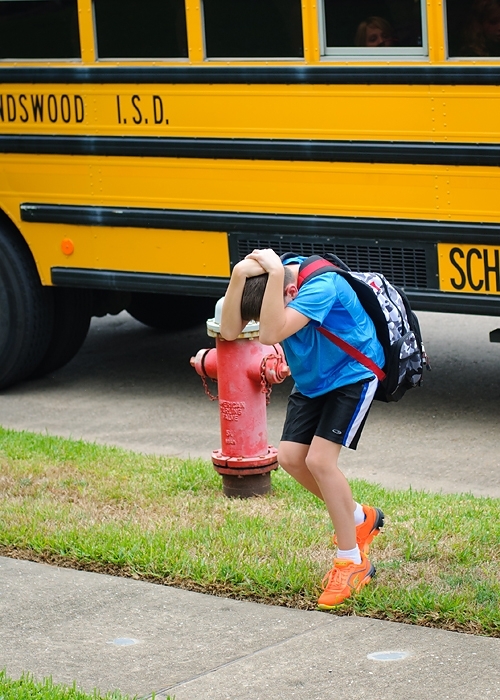 But today, I’m going to write about the first day of school because I haven’t missed blogging a first day of school since 2006. That’s eight years of first days, which honestly makes me feel a little old. 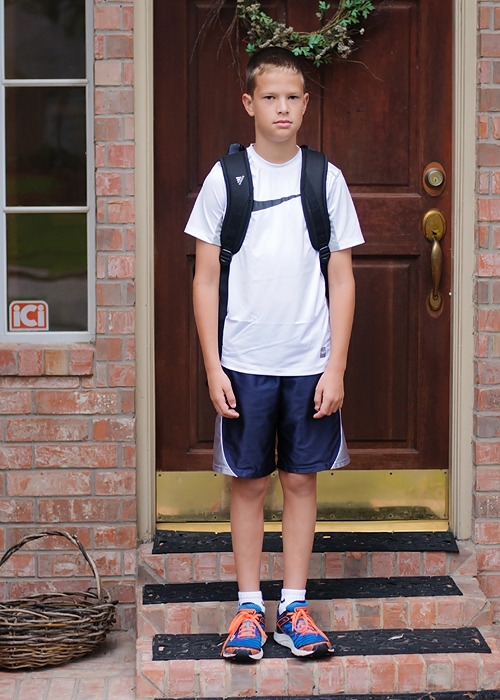 First up, Connor, the big 5th grader. Can’t believe that this is his last year of elementary school. We moved this summer (need to post about that, too! 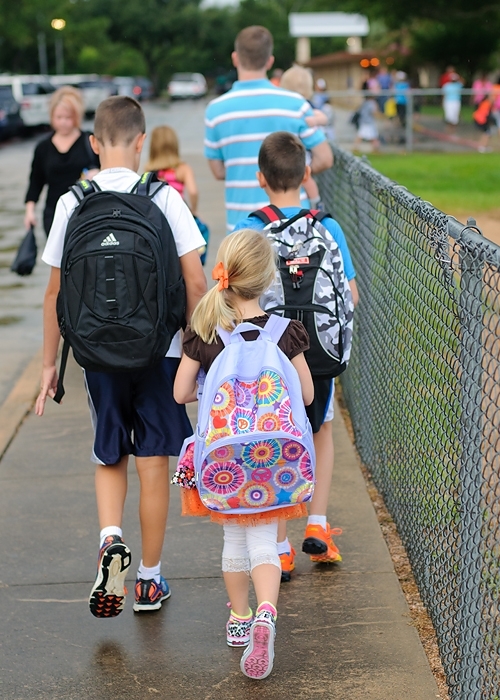 ), and even though it’s only about 10 minutes away from our old house, it’s a new city and new schools. I love that boy, pouty lip and all. 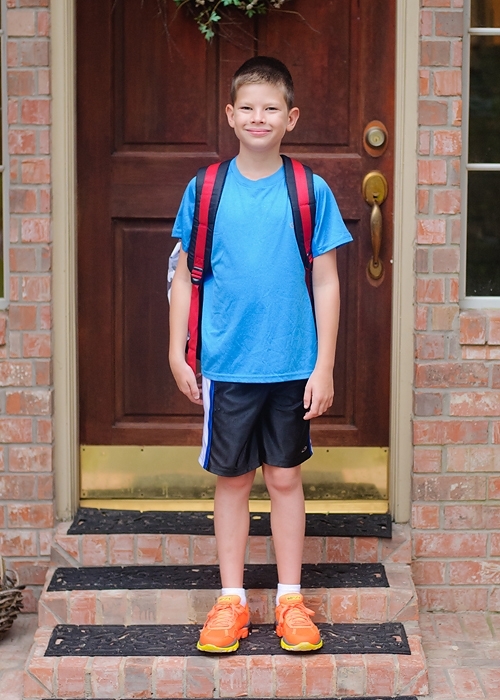 He’s always had a hard time with transitions, and the first day of school is no exception. In a few days (weeks?) it will all be good again. Next up, my third grader. Third grade always seems like a big jump to me. All of the sudden, he’s in Big Kid territory. He’s more than halfway done with elementary school. 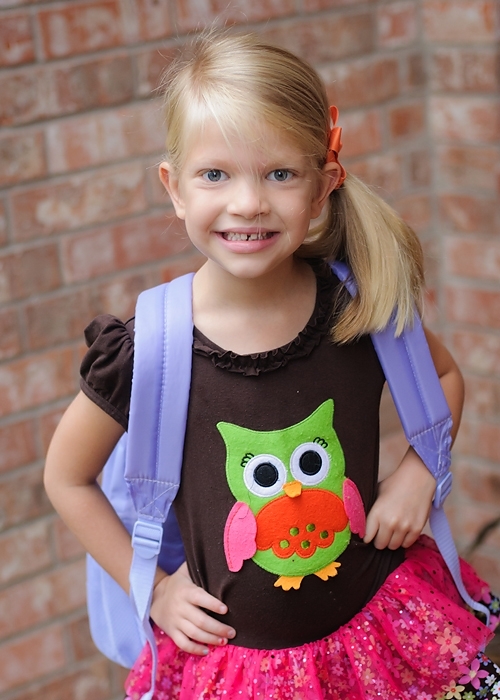 And, my baby girl who is most definitely not a baby now that she’s a kindergartner. I went back and forth and back and forth about sending her this year. But, at the end of the day, I know she’s ready. She’s so excited to go to school with the boys. 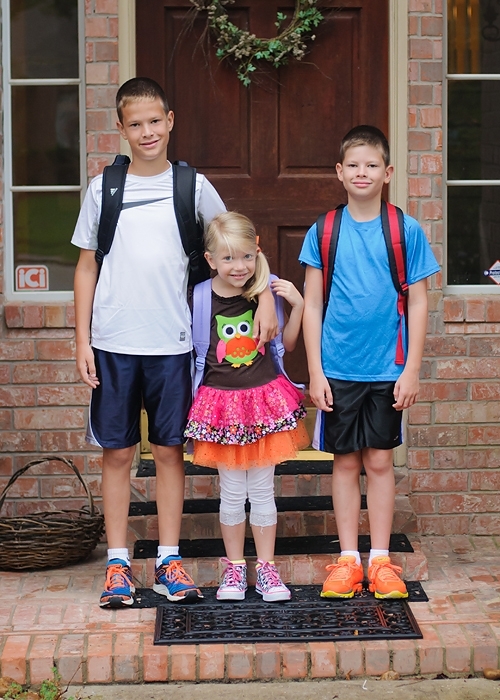 This will be the only year they all three go to the same school. We were only running a few minutes later than planned, which I will count firmly as a win. 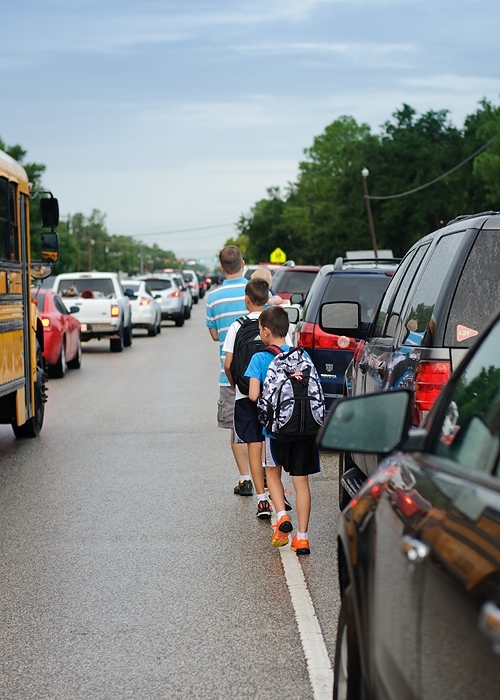 There was crazy first day of school traffic this morning! 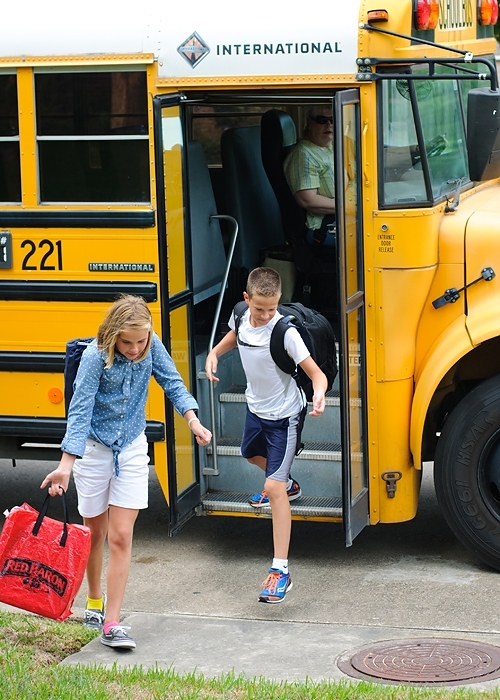 Tomorrow they will start to ride the bus. 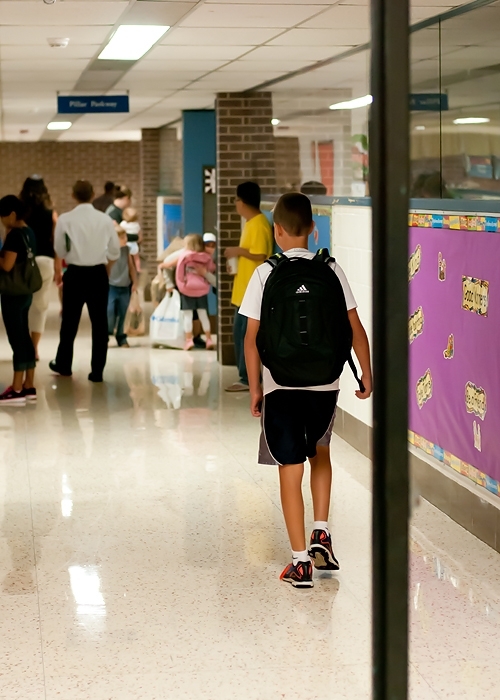 At their new school, they only give parents a free pass to walk to class for the first day. They jump right into their regular year, which I definitely appreciate! First up in the drop off was Logan (simply because we passed by his classroom first.) 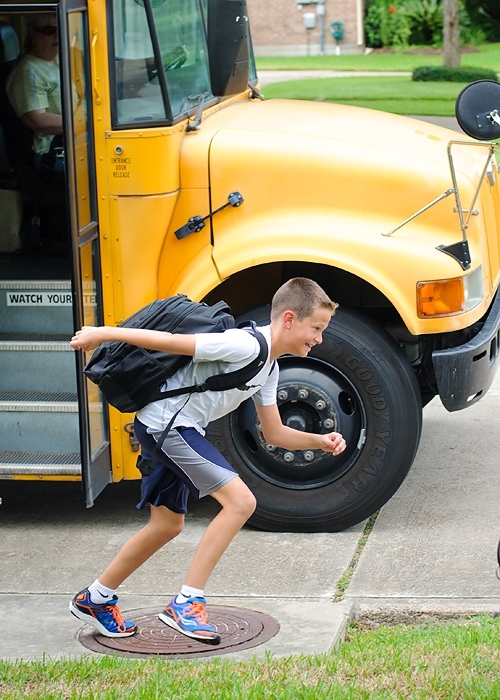 He walked right in, and even though I know he is nervous about starting a new school, I also know that Logan is one of the most likeable kids ever and he will make new friends in no time. Connor didn’t want us to walk him to class this year, which made me a tiny bit sad, and I really thought about following him anyway. But, I decided that this was one of those letting go moments. He really is growing up, and this was one small way he wanted to exert his independence. This was the only picture I could get of him as he walked away. Big kid. And finally, the big moment. All through preschool Camryn had a bit of a hard time with the initial drop off/walking in part, but she did great today! 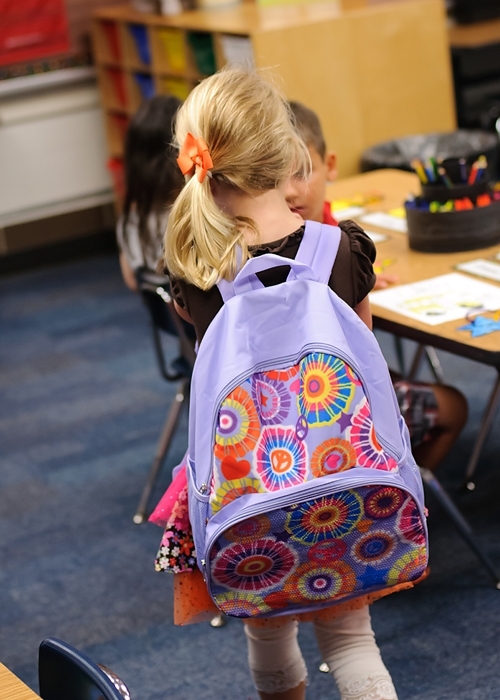 I could tell she was nervous and unsure of herself–where does my backpack go? What about my lunchbox? I assured her that Mrs. K would help her out with everything, and all she needed to do was sit at her desk and color. She was all smiles (albeit, slightly nervous smiles…) and I also like how her hair is already falling out of her side pony. Can’t wait to see how it looks at the end of the day! 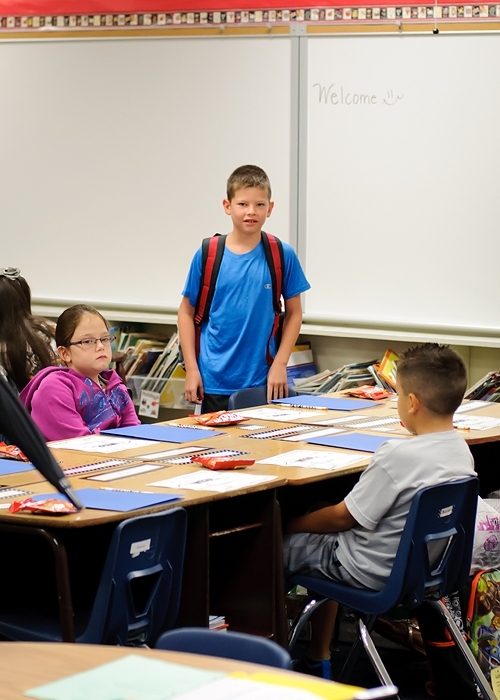 Derek isn’t always able to come with us on the first day of school, but this year he was able to. I know Camryn loved that, and I loved catching this sweet moment as he gave her good-bye hugs. So there you have it, the first day of what’s going to be a great year! 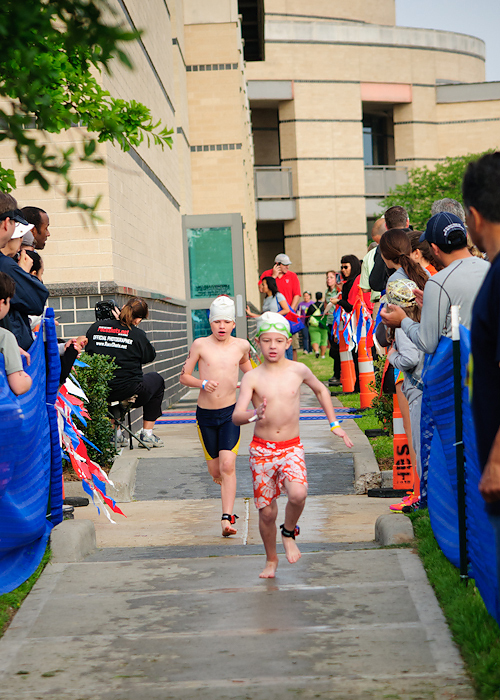 Last year, we joined in with a group of our friends and signed our kids up for the Houston Kids Triathlon. We really had no idea what to expect, but it seemed like a fun idea. The kids really liked it, so I decided to go ahead and sign them up again this year. I ended up not getting to see them race last year because of a girls trip that had been planned forever, so nothing was going to stop me from being a crazy proud mom out there with my camera all during the race this year. We had the added bonus of Derek’s parents coming into town for the weekend, which was especially great not just because they could see them compete, but also because that’s 4 extra hands! And Nonny Hands really should count for more. She took care of Camryn and Sullivan pretty much the entire race. Sunday started bright and early. We were all loaded and out the door by 6:15, with only one quick turn around needed to grab the forgotten baby stroller. 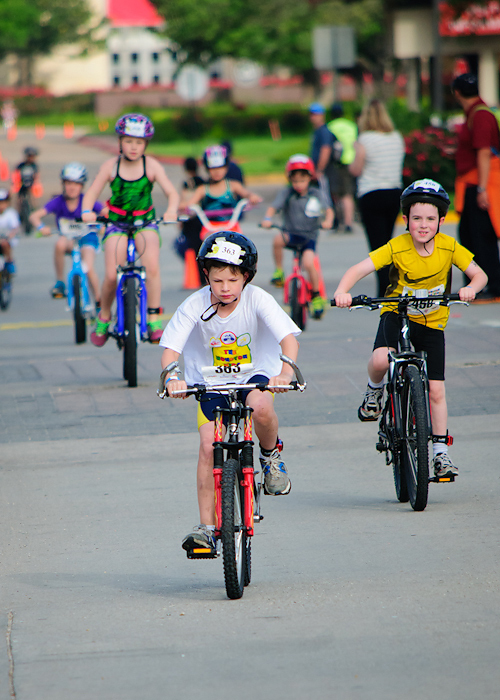 There were over 1500 kids racing, so as you can imagine, it took awhile to get everything started. 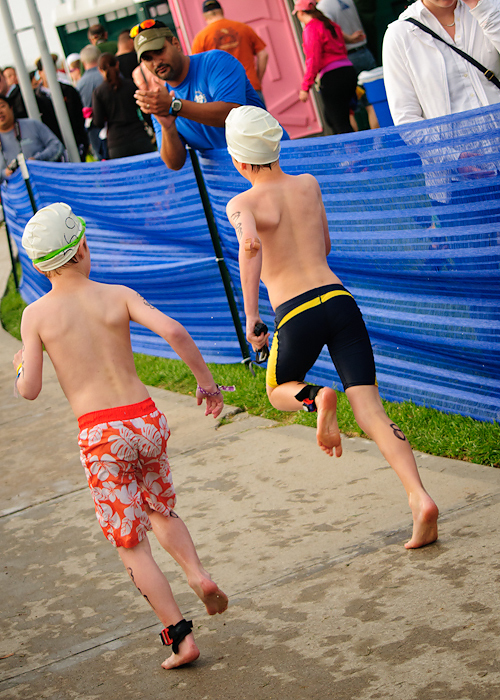 The kids race in waves based on age, and it’s a stagger start pool swim. Logan was up first. 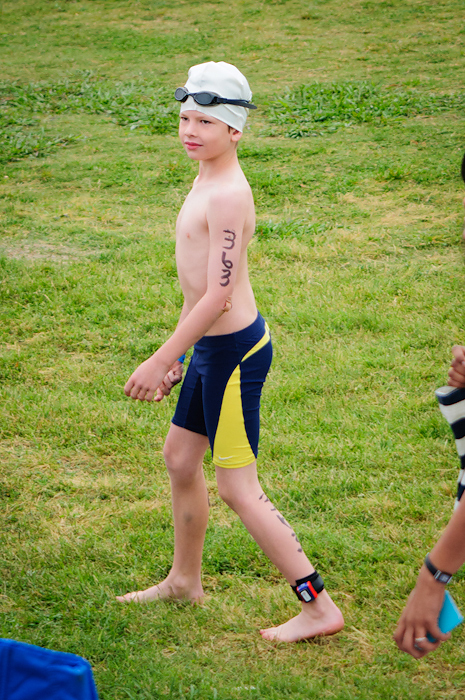 His race was a 100 yard swim, a 3 mile bike ride, and a .5 mile run. 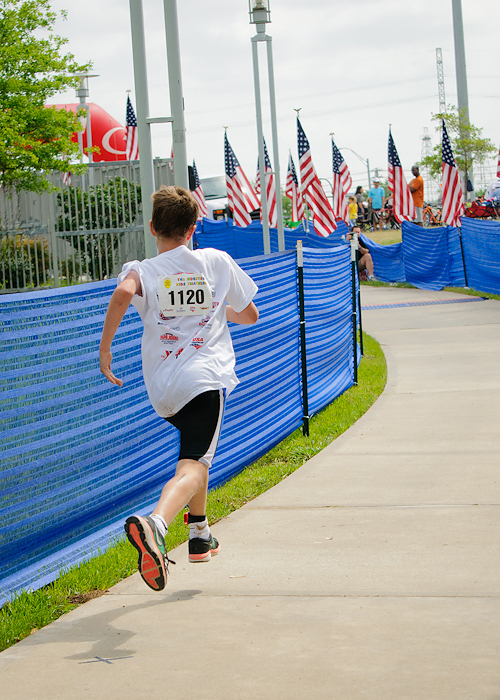 As his age group marched past us, he acted all like he couldn’t hear us cheering and hollering for him. He gets so embarrassed about that kind of attention, but I just can’t help myself. 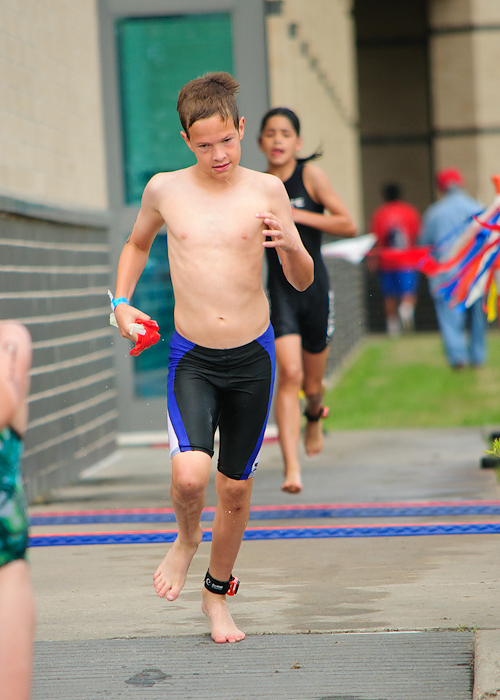 He came out of the pool looking strong! love the tongue sticking out. Up next: transition. I probably shouldn’t admit that I still tie his shoes for him most mornings. 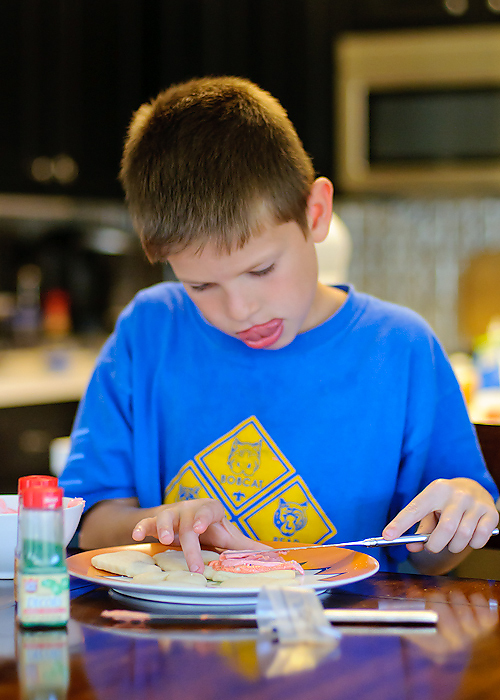 I’m glad to see that he can do it by himself, even if it does take complete concentration. 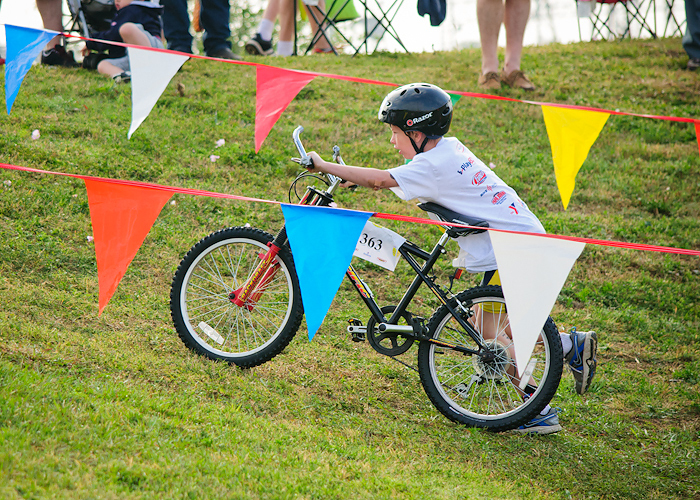 He had to get his bike up this big hill. His bike is heavy! He slipped on the wet grass, but kept on trucking. I was so proud. And finally, the rubber meets the road. 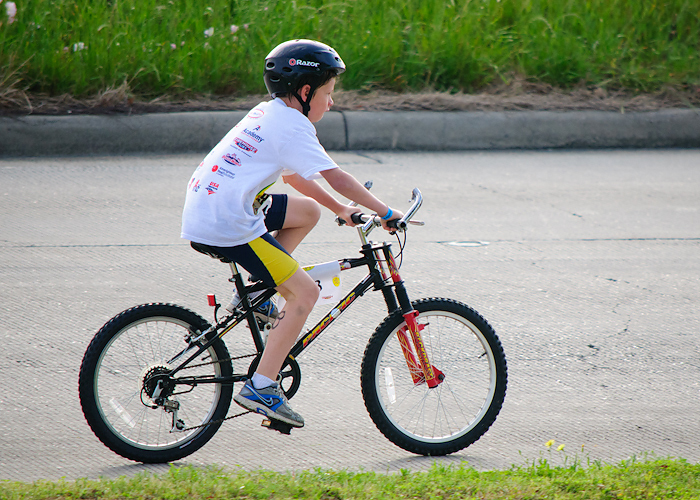 His biking portion took a little longer than I expected, and it turns out it was for a good reason. 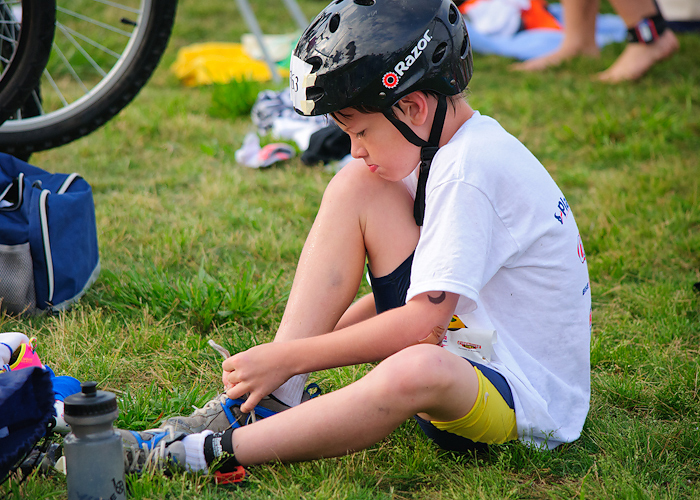 His chain fell off in the middle of the race, but luckily they have volunteers out on the course and someone fixed him up right away. And here he is going strong to hold his spot. Love the intensity! 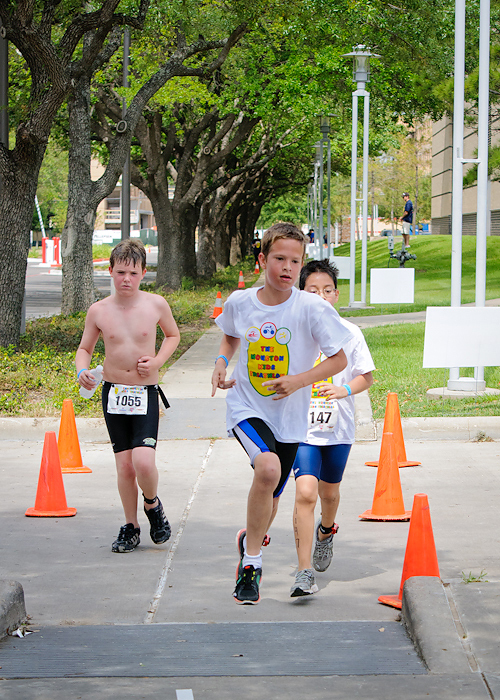 In an extremely unfortunate turn of events, I did not make it to the finish line in time to see him finish. 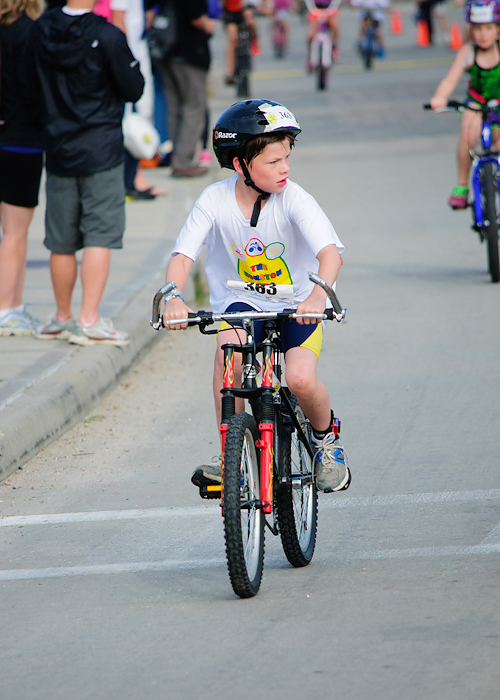 Like I mentioned there were 1500 kids participating, and 950 of those were in the junior division (which is kids 10 and under). That equals tons and tons of parents, all running around like crazy. 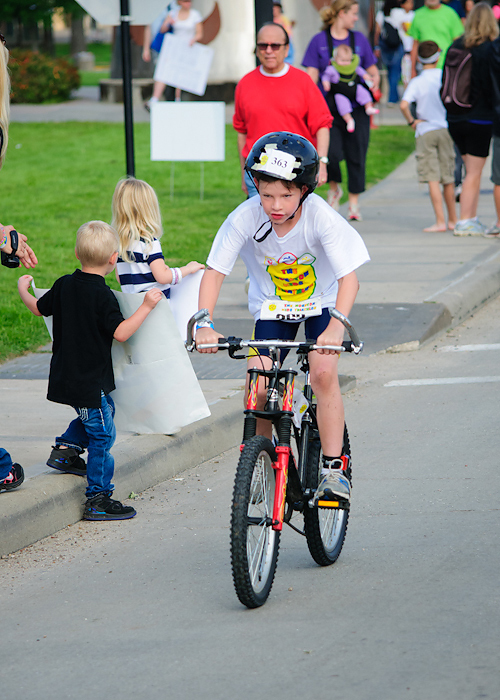 There was a huge crowd to get through, and Logan’s half mile run only took him 4.5 minutes. I waited and waited at the finish line and eventually sent Derek over to the corral where they keep the kids to see if he was there. Sure enough, he had already finished. The photographer in me was totally bummed to miss the photo op! But the mama in me was just proud to see his smiling face. He loved it. And he did great! 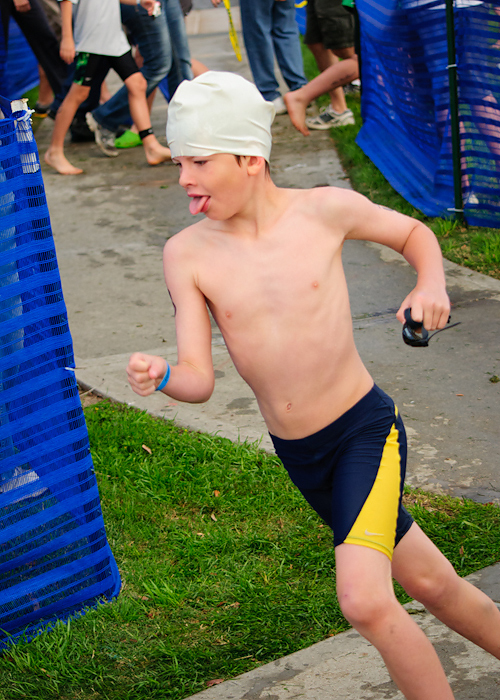 He ended up finishing 19th out of 110 in the 8 year old boy division. After a bunch more sitting around, it was finally time for Connor’s division. 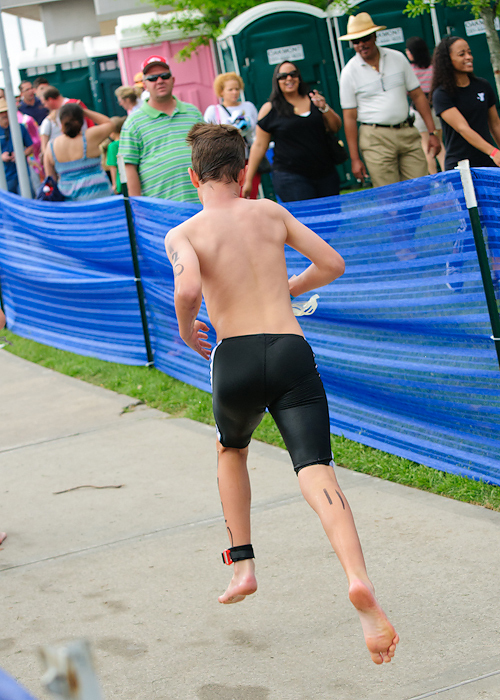 Connor raced in the senior division which was a 200 yard swim, 6 mile bike ride, and 1 mile run. If you know Connor, you know he is intense in everything he does. 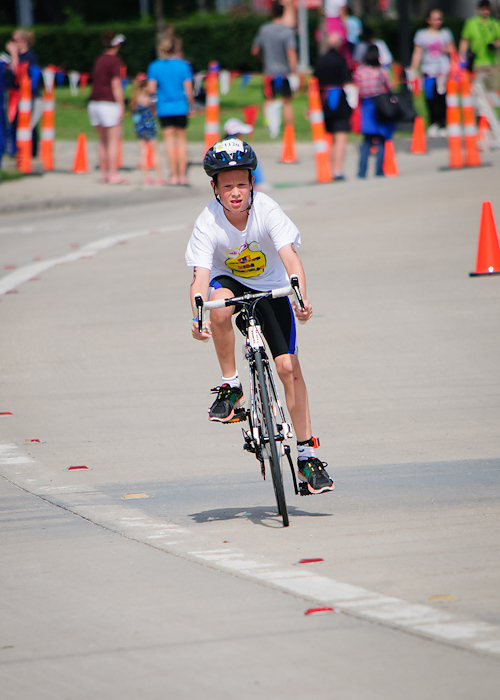 This triathlon was no exception. 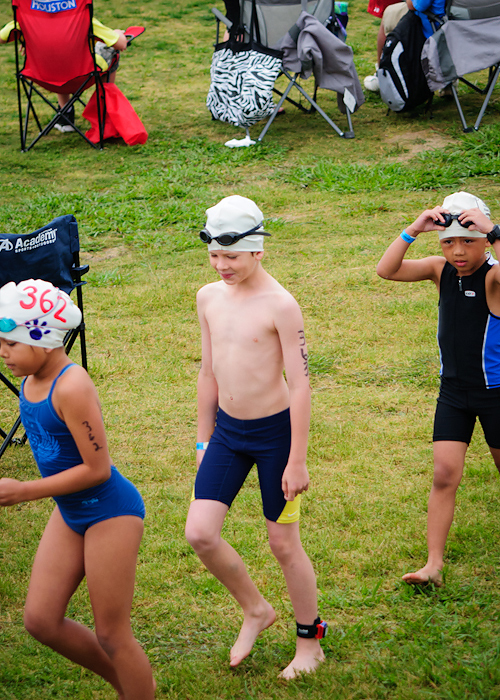 He was in the zone coming out of the swim! 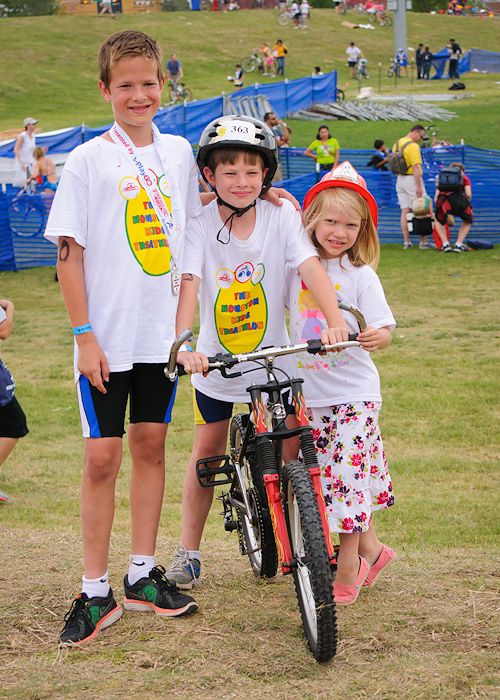 Ready for the bike race. We actually rented him a road bike for the day. 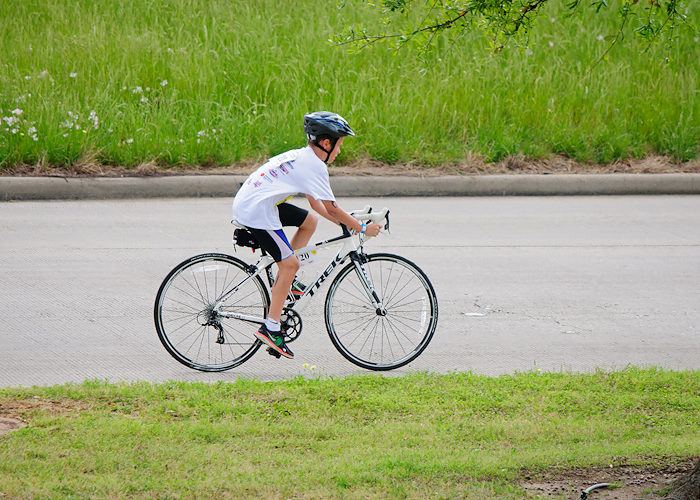 His bike is broken, and plus he had two soccer games to play later that afternoon so we thought it would be worth it to get him on a nice bike and save his legs. I definitely think it was worth it! And he did, too. Of course, now he thinks he needs to always ride a $3000 bike. Dream on, kiddo. The senior race wasn’t quite as huge (only 575 racers), plus he was at the very beginning of the heats, plus tons of the crowd had already cleared out, plus his running portion was a mile long which we figured gave us 8 minutes or so. We made it to the finish line with plenty of time spare. We were cheering him on so hard! Finish strong! Push it! Give it all you got! And so he did, passing up these guys in the home stretch. I love when we glanced back to make sure he had really passed them by. Connor was fast. Like we wondered if maybe he would place in the top three fast. We debated staying around for the awards, but in the end, as soon as we could get in the transition area to get bikes, we headed home. Nonny and Pops were ready to get on the road, plus Connor had his soccer games to get ready for. 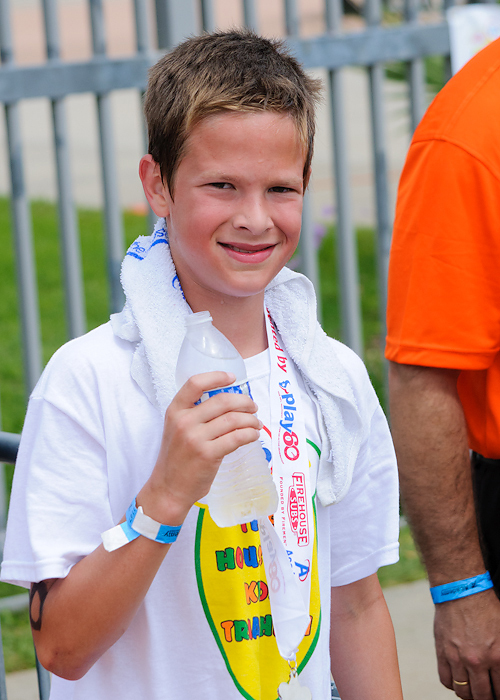 Even more amazing than the 2nd place finish is the fact that he cranked out a 6:18 mile. 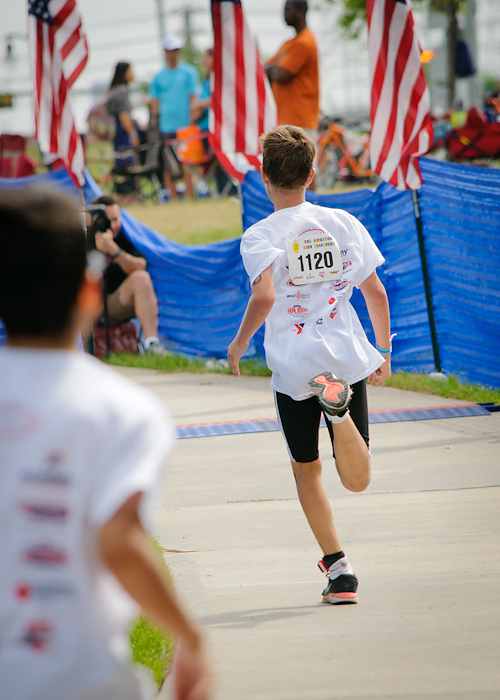 That was actually the 8th fastest mile time out of all 545 senior competitors–which is kids up 15 years old! 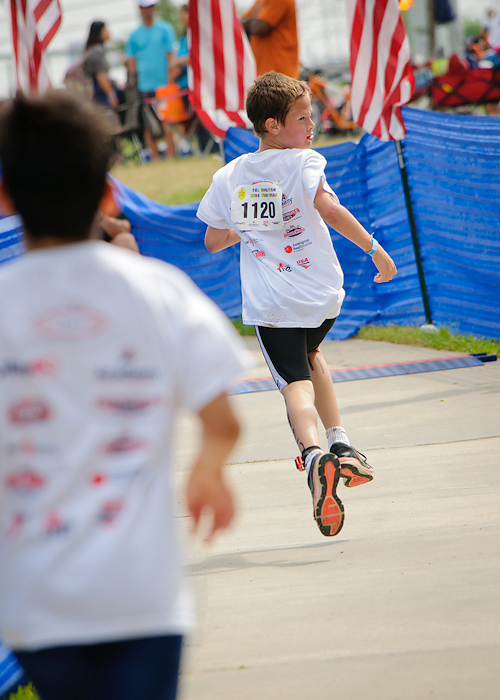 That kid is a runner. All in all, it was a great event. I’m so proud of both my boys! I can’t wait until next year. I’ve let another month go by without blogging! 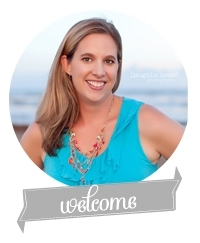 I have the best intentions of making time to blog again, but it’s just not happening. I definitely have a great excuse, and I won’t complain. But maybe, just maybe, 2013 will be the Year I Start to Blog Again. There is much to write about…Christmas, our trip to San Fransisco, Connor’s birthday, and more. But today I’m just going to share about Sullivan since this blog is kind of like a baby book. Sullivan went to the doctor today for a 3 month weight check. He’s still a tiny peanut, weighing in at 9 pounds, 15.5 ounces. You should have seen the nurse and I rooting the scale on to 10 pounds, but it just didn’t make it there. I can’t believe I have a three month old who weighs less than a lot of kids at birth! He is finally out of his newborn clothes and diapers, but only because he is too long. While he is tiny, he’s holding steady on his own growth curve, so that’s good, although my doctor does keep hoping to see a big jump in his weight. We discovered at two months that he has a diary intolerance, which means I’ve had to cut all dairy from my diet since he is nursing. It was hard at first (diary is hidden in so many things! ), but now it’s pretty easy except when we go out to eat. I’ve discovered some yummy treats that are dairy free like Oreo cookies and Ghirardelli double chocolate brownies. I eat a lot of hummus and pita chips, Oatmeal Squares cereal, turkey sandwiches with mustard, and fruit and veggies (well, sometimes I eat a lot of veggies. I have the best intentions, but I’m still kind of like a little kid when it comes to vegetables.) Sullivan definitely acts happier and is more comfortable since we have gone dairy free. He eats about every 3 hours during the day, and in the past few weeks has started sleeping 7-8 hours at night (from 11:00-7:00 or so). Hurray for sleep! He seems to be pretty laid back and go with the flow, which is just what you need in a 4th baby, right?! He tags along with us anywhere and everywhere and rarely gets fussy about it. What a champ! The big kids are crazy about him. They love to hold him can carry him around. Camryn is a huge helper and seems to love her role as big sister. I’ve gone 3 for 3 with month by month pictures! Okay, so the 2 and 3 month photos were a few days late, but still! I’m thinking I might actually keep up with this for the whole year. I’m feeling especially sentimental about this little guy. I drove past the hospital today on the way to our appointment. It feels like just yesterday that Derek and I spent half and hour trying to park and get into the hospital in the wee hours that Sunday morning for my induction. The hospital was under construction, and the first door we tried was locked, so we went to the emergency side only to find that there were no parking spots available. Then once I finally got inside (Derek ended up dropping me off while he found parking), I couldn’t figure out how to get to maternity since I had only ever gone there from a different entrance. I waddled around, half asleep, until Derek finally caught up with me and helped me find my way. But at the same time, I can hardly remember what it was like before Sullivan came along. It’s like he’s always been here. Maybe I’m sentimental knowing that he is our last. Maybe it’s because it’s Christmas, or because my oldest just turned 10 and I can hardly believe that I’ve been doing this mothering thing for a decade. It’s probably all of those things. I just can’t believe that my first baby is 10 and my last baby is 3 months (which I realize 3 months is not a long time at all, but it’s going by so fast!) All I know is that I am so glad this little guy joined our family and that God blessed us with another baby. I’ve always wanted a big family, and even though there are times that I want to run away and hide in a place where I can be alone and not have anyone demanding anything from me, I know I wouldn’t trade this life for anything. 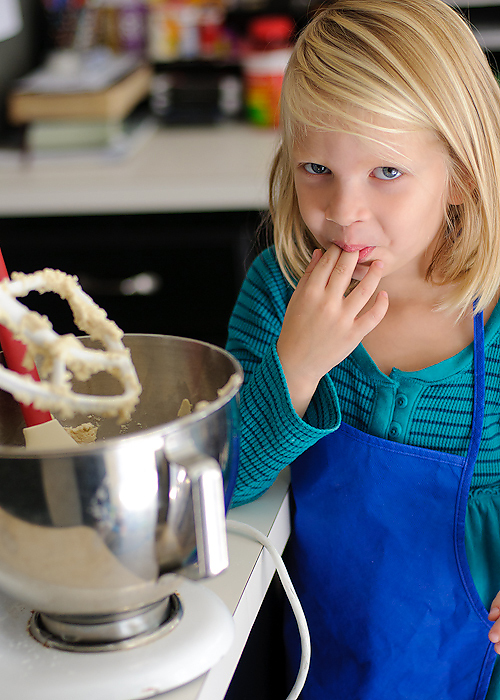 Before I had kids, I always pictured myself as that stay at home mom who loved to bake with her kids. I really do enjoy baking (hello, cookie dough. I love you forever and ever.) 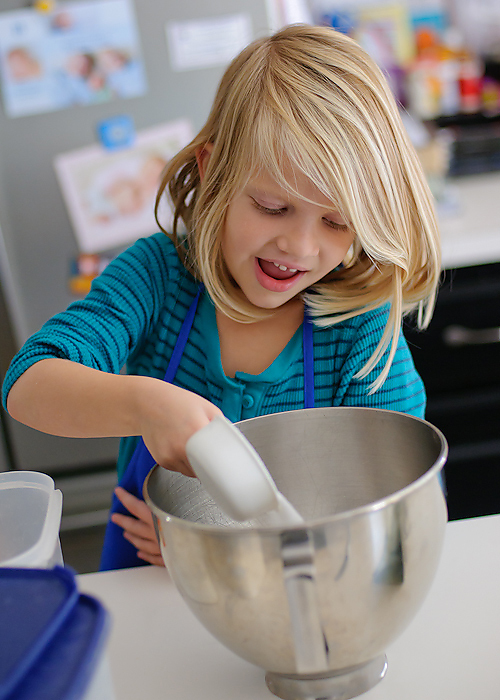 But baking with my kids? Not so much. The boys burst that bubble long ago. Connor had pretty much zero interest in helping in kitchen. I can remember one time baking cupcakes with him and it being an enjoyable thing. The other times he either lost interest immediately, or just refused to even be a part of it. Logan has always had a little more interest, but Logan didn’t earn the name captain disaster as a toddler for nothing. Plus he isn’t known for having the world’s longest attention span. 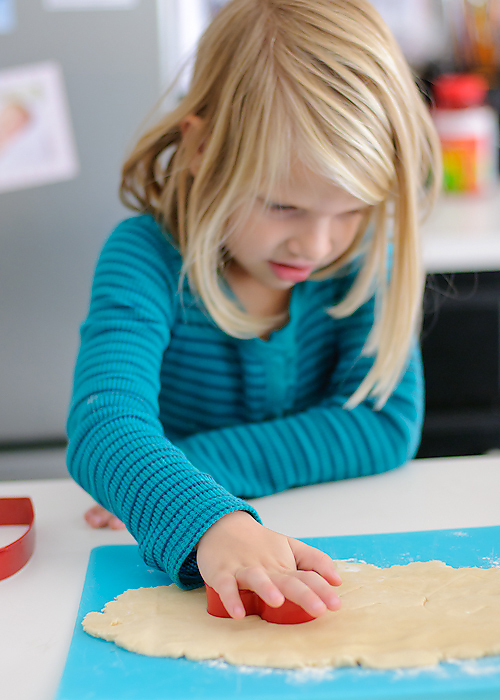 For the past several years, I’ve done all of the baking on my own, sometimes maybe even discouraging little helpers from “helping”, knowing full well that it just ends in frustration each and every time. 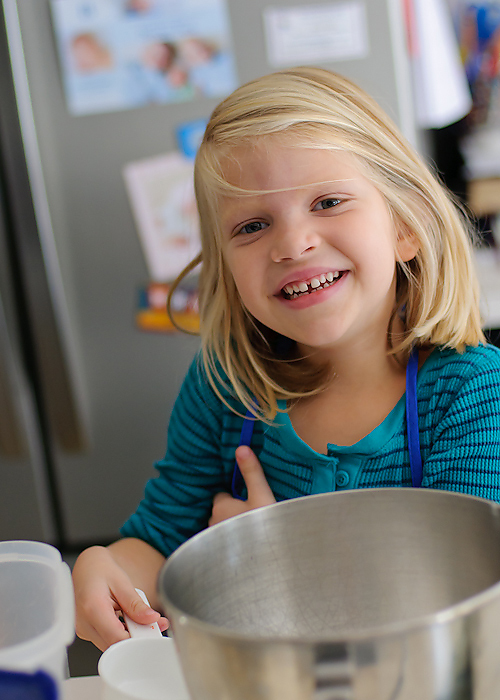 Baking with my kids definitely goes on the list of those things that are way more fun in theory than in reality. But then along came Camryn. She loves to help in the kitchen, and most of the time (especially if the boys aren’t home), she is actually pretty helpful. 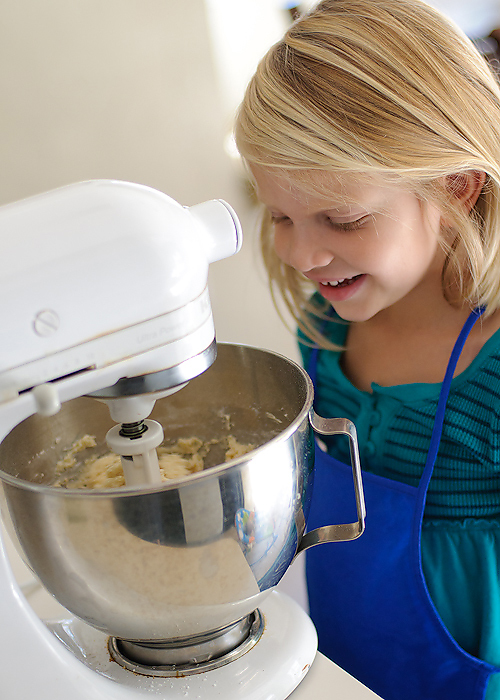 Who knew that baking with kids could actually be fun! I think Camryn has been feeling a little displaced ever since Sullivan came along. I suppose it’s to be expected since she was the baby of the family for four years. She loves Sullivan and is a great helper, and she never takes any frustration out on him. But we’ve definitely seen a lot more whining, crying, and bad attitudes over the past month. 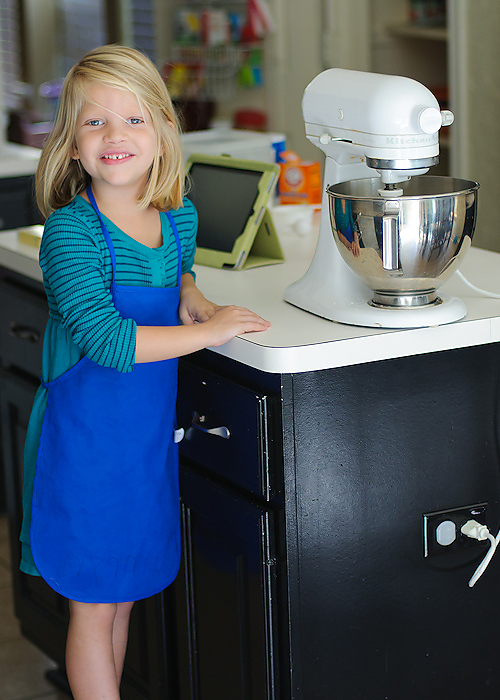 So one day last week, I decided that Camryn and I needed to bake together. 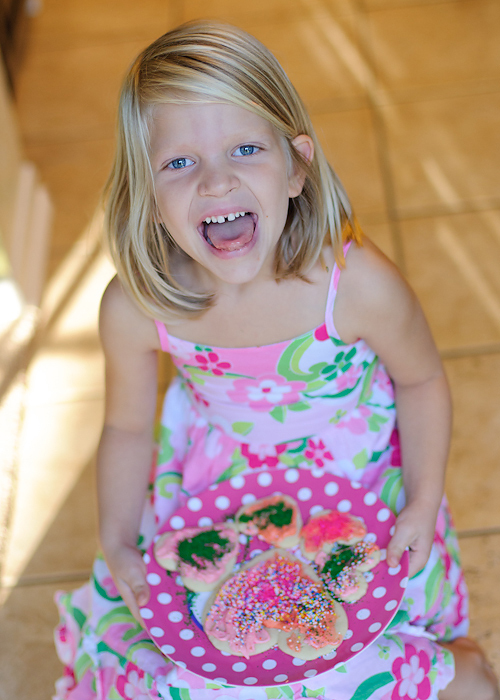 When I told her that we were going to bake cookies, you would have thought it was Christmas morning. She was so excited! 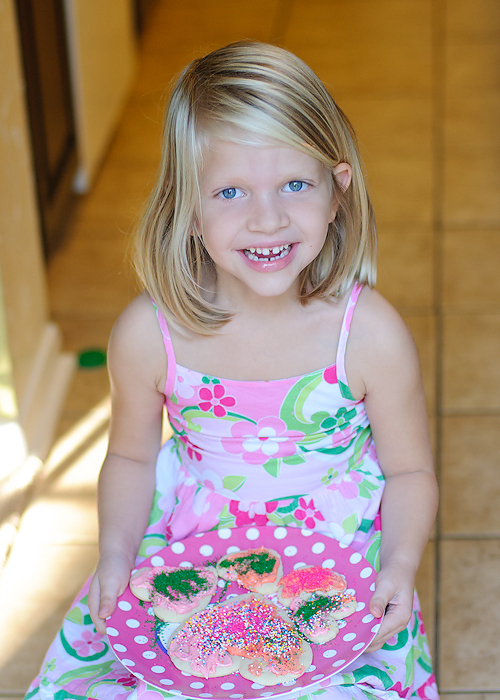 I decided I wanted to bake Annalee’s sugar cookies. I love these cookies! They stay nice and soft, which I love. As you can see, she was thrilled. She even put on her apron for the occasion. She kept a careful eye on the mixing progress. Then it was time for my personal favorite part. Taste testing the dough is imperative! We both gave it two thumbs up. She decided she wanted to make heart shaped cookies. You know, since it’s November and all. 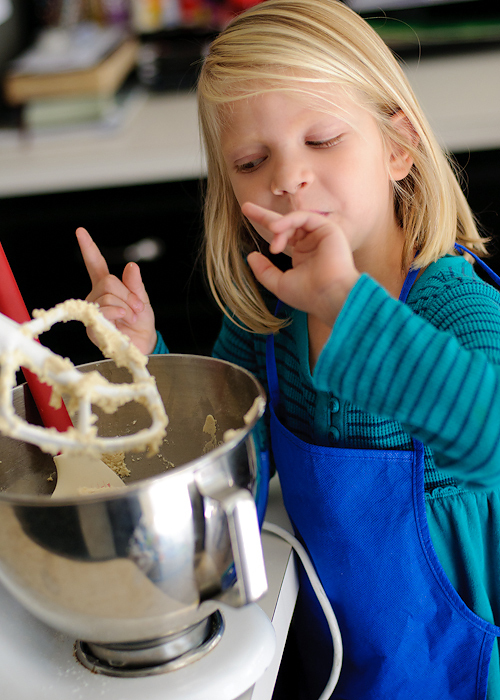 Then, much to her dismay, we paused our cookie making fun at this point. It was time for lunch and naps and feeding Sullivan. It was much later that afternoon before we got to the decorating part. 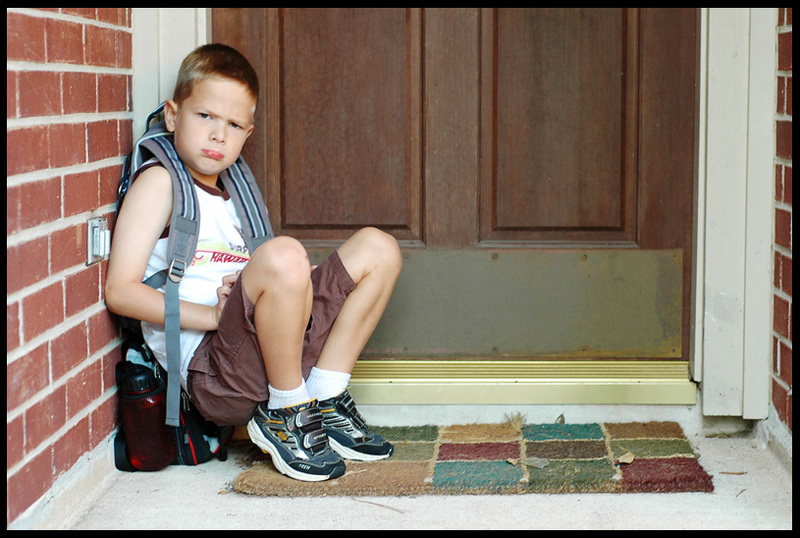 By then, Logan was home from school and got to join in the fun. This was the perfect amount of involvement for him. 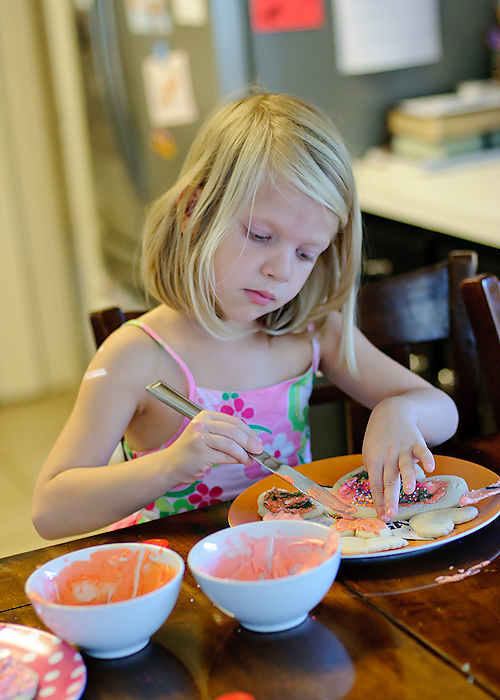 He decorated about 3 cookies and than ran off in search of better things. She was so pleased with her finished product. Would you like some cookie with your sprinkles? It was a great afternoon. 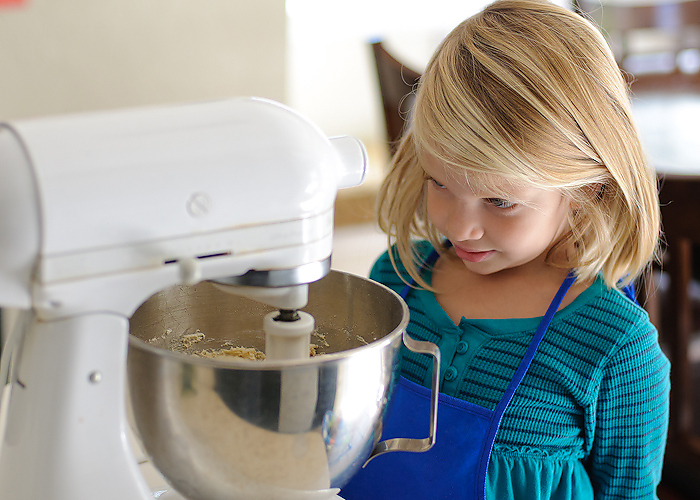 It was the kind of baking experience I always dreamed about having with my kids. I’m so thankful for this spunky little girl and the girly-ness she brings to our all boy home. P.S. 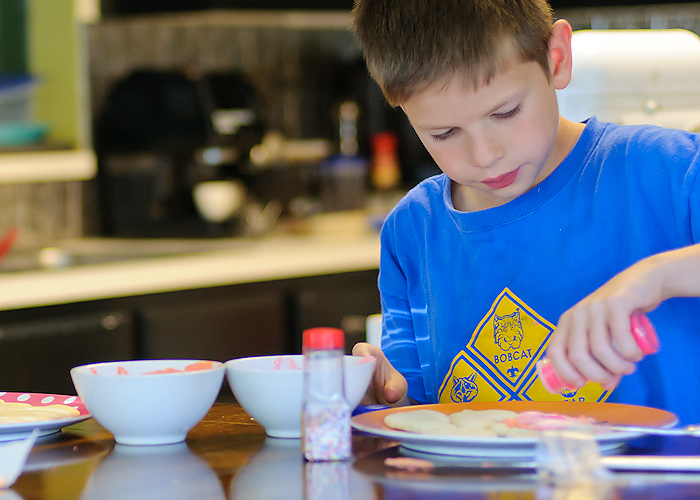 I think I am still cleaning up sprinkles off my table and floor.